The village sign, erected outside the Village Hall in October 2014, was commissioned by the Parish Council to commemorate the Queen’s Diamond Jubilee in 2012. The sign contains elements from each ‘end’ of the village – Streetly End, the Church end and Burton End – with the scroll beneath symbolising the road linking them all together. The crown-shaped surround represents the Diamond Jubilee with the wheat sheaves on top signifying both the arable fields which surround the village today and the village’s historical agricultural past. 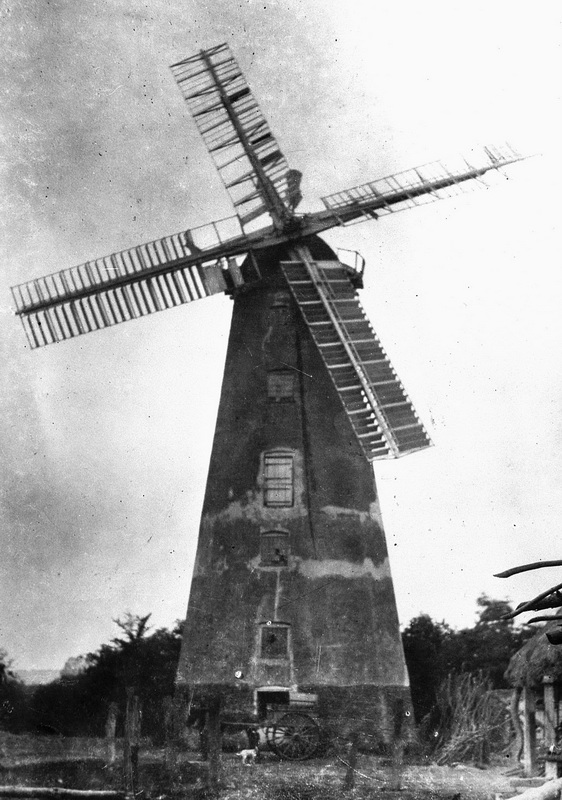 The mill before the sails were blown of in 1895. 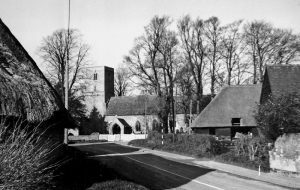 THE WINDMILL, STREETLY END – windmills in Streetly and the other medieval manors in West Wickham were recorded as early as the 13th century. These would have been fairly small and mainly of wood construction – rather like the windmill that still stands in West Wratting – and would have been on exposed sites where they could make best use of the wind. The Enclosure Award map of 1822 seems to indicate that there was a mill half way along what is now the drive to Hill Farm and near a small field called Millers Close. Other than that, the sites of these earlier mills remain unknown. The existing mill at Streetly End was built in 1802. It is a tower mill of brick construction which meant a greater height could be achieved, allowing the mill to be sited on lower ground and still catch the wind. The mill was originally multi-purpose. As well as grinding corn, it was used for pumping up water for the adjoining tan yard and to run machinery to grind the oak tree bark that was an essential ingredient of the tanning process. Nothing is known of the work done there but the hides of cattle and horses were probably being turned into leather to be used for shoes and boots, saddlery and horse harness and in the local gloving industry. The mill, tan yard and an adjoining maltings were owned at this time by Daniel Taylor, a member of a prominent non-conformist family which also owned mills, tan yards and maltings in Linton and Burwell. The tan yard ceased operating sometime after Daniel’s death in 1827 and the mill was then used in the traditional manner for grinding corn. The mill ceased working around 1895 after the sails were blown off in a storm. ST MARY’S CHURCH – the present church building dates from the 13th century with additions in the 14th and 15th centuries but there may well have been an earlier wooden church on or near the site. It was built of field stones with ashlar dressings, probably at the instigation of Aubrey de Vere, Earl of Oxford, who was lord of the Wickham manor. For 800 years, the church has played a central role in the rites of passage – baptism, marriage and burial – as well as the spiritual life of generations of villagers. Over time, the church has also had an important role to play in poor relief and education. The most renowned incumbent was probably John Ramsden Wollaston (1791-1856) who was perpetual curate from 1825 until 1840 when he and his family emigrated to the newly established colony of Western Australia. There they led a hard, pioneering life as the Reverend Wollaston did much work to establish the Anglican Church, becoming the first Archdeacon of Western Australia in 1848. In 1984 he was recognised as ‘a local saint and hero’ of the Anglican Communion. A Lancaster dropping food supplies to the Dutch, May 1945. THE LANCASTER BOMBER & RAF WRATTING COMMON – the Lancaster bomber, which along with the Stirling flew from RAF Wratting Common in the Second World War, represents a rather short period in the village’s history but one which has left a lasting mark on the landscape, with its hangars still plainly visible from Burton End. This was a temporary wartime airfield, opened in May 1943 and closed at the end of April 1946. 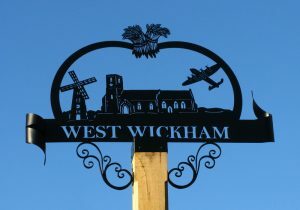 The airfield, which covered five parishes, was originally know as RAF West Wickham but soon changed its name, possibly to avoid confusion with RAF High Wycombe in Buckinghamshire. 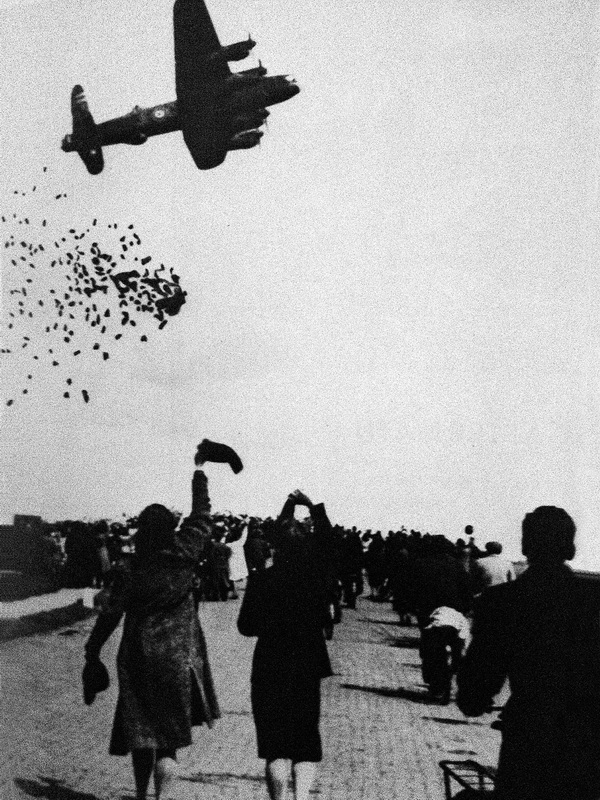 Planes from the airfield took part in many bombing operations over Germany but the Lancaster has been chosen for the village sign because of its humanitarian role at the end of the war when these planes flew from RAF Wratting Common with food parcels to relieve the starving people of the Netherlands as part of operation Manna. A more detailed history of RAF Wratting Common can be found at: http://www.wcnhistory.org.uk/. There is an airfield memorial at the former entrance near Weston Woods Farm and a Book of Remembrance in St Mary’s Church, West Wickham. The project was led by Parish Councillor, Di Licence and the design was drawn by Trevor Hall from ideas and suggestions submitted by village residents. The sign has been cut from 6mm mild steel by Martin Chamberlain and the oak post and brick plinth were made by Tom Licence.